I snapped this picture of Kyle right before he left for school this morning. For the past few days he has been planning this day: Wednesday—the day he was going to wear ponytails to his new school for the first time. On a few occasions K & O had gone to school with ponytails in their hair at their old school, but they were much younger then. The older they get, the more deeply engrained gender is amongst their peers; the more firm the gender divides; and the more established the unwritten rules, roles, and expectations become around gender. So, when Kyle first started talking about wanting to wear ponytails to his new school (now, at age 6.75), I was nervous for him. We talked about it quite a bit, and quite often, over the past few days. Both Owen and Kyle were fully on board with this. Owen ended up wearing purple nail polish to school today instead of ponytails… with the same intended point to make to his peers. We talked and talked about it, mainly with me playing devils advocate, verbally hypothesizing all the possible scenarios, and them explaining in detail how they’d handle each one. And I also asked questions. Throughout they were self-confident about their plan, calmly excited to do it, and determined. I’ll admit— it makes me both proud of them, and anxious for them. There is a part of me that—at this point (as they are almost 7)—wants to frantically prohibit them from doing it, in a panicked desire to protect them from possible damage that might result. They are, after all, black boys in a fairly diverse, but still, majority white school. Their new school is a Quaker Friends School – we’d like to hope it would be the place where gender bending could safely happen – and yet we know the reality of the situation: gender bending is a social risk for boys in virtually any arena… even the most liberal of mainstream spaces. And so, I was tempted to try to convince Kyle to not wear the ponytails. I was tempted to try to convince Owen to not wear the purple nail polish. I was tempted out of my fiercely protective motherly instinct. But another part of me felt really proud of my self-confident, self-assured, playing-around-with-the-rules, and questioning-the-status-quo boys. As their sociologist mother, I am sure it is no coincidence that their chosen day to make their big statement was a Wednesday. I am not sure if they are fully cognizant of it or not, but there are two reasons why Wednesdays are significant for this: 1) Every Wednesday is an all-school assembly, so they will be seen by everyone, and thus get the biggest possible reaction, and 2) Wednesdays they have basketball after school. Kyle and Owen are, by far, the best basketball players amongst their peers. They are, unquestionably, superb athletes. They are too young to play for the school’s real team, so basketball for them is the once-weekly-basketball-intramural-program for the kids younger than 4th grade. It is sort of the “Junior Varsity” of the elementary school set, if you will. The coach quickly noticed what good players Kyle and Owen are, and established a rule that they needed to be separated onto different teams for any scrimmage or match (because otherwise they will ridiculously dominate). Yesterday when they played basketball outside during recess Kyle and Owen somehow managed to get themselves onto the same team, and they won 22 to 1 (according to them, they “let the other team get that one basket,” because, “they felt sorry for them”). According to Kyle and Owen, the other kids “told on them,” saying it wasn’t fair, that it was no fun to play if K & O are allowed to be on the same team, and in response the teachers apparently set a new school rule that even at recess Kyle and Owen must always be on separate teams. This is all just to say: they are really good at basketball. And this is important. Because, of course, for boys, athletics and masculinity go hand-in-hand. Kyle and Owen’s athletic superiority is unquestionable. And thus, Kyle and Owen have that extra-special-privileged shield of boyhood: the shield of unquestioned masculinity. And thus, they can get away with wearing ponytails and purple polish to school. Even on an All-School-Assembly day where everyone will notice. Kyle and Owen also have a deep, core, forward-presented self-confidence. While as their mother I intimately know the vulnerable places of their fragile souls, the world sees them as unabashedly self-assured. I don’t think they are perceived as cocky (at least not yet, thank God, and we’ll need to continue to work on making sure that doesn’t develop as the years go on), but their self-confidence and social extrovertedness is unmistaken. This, for sure, only adds another layer to the unquestioned masculinity which gives them the gumption to do the “crazy” things that they do where gender is concerned. In a strange coincidence (or maybe it isn’t a coincidence? ), we are reading Barrie Thorne’s Gender Play in my undergraduate Sociology of Children and Childhood class right now. Yesterday I had the students come to class prepared to read aloud their favorite quotes from the book and then explain why they had chosen the quotes that they had. It led to the best discussion we’ve had this semester. As I listened to my college students talk about gender and childhood I couldn’t help but think of Kyle and Owen. As the discussion turned to gender-bending I told the class about my boys’ ponytails-and-purple-polish-plans for today. One of my favorite students of all time (I’ve had him in several courses), happens to be in that class. He’s a smart-as-a-whip, incredibly-nice-and-polite, gorgeous, very popular, huge, dark-skinned, black super-star football player from Nevada. He spoke articulately about the social power of boys who excel at athletics, about their unquestioned masculinity, and about how he himself used to wear pink sneakers and carry a pink backpack during high school. And then he said, “Don’t worry Heather, they’ll be just fine!” And in that instant I truly was assured. While I knew it to be true intellectually (from Gender Play and a hundred other studies I’ve read on the matter), it took that moment in class to allow me to know it to be true emotionally. And so, this morning as they left for school, at my intellectual, moral, philosophical, and emotional-motherly core I was more than o.k. with the ponytails and purple polish. While I could write a whole other post on the fundamentally problematic complications that all of this raises in regards to the privilege my boys carry that other boys don’t (etc., etc., etc. ), for now I am alright with savoring this moment of watching my boys use this part of their privilege to question the power structures of gendered masculinity and femininity. It is a first step in one of the most basic things we’re trying to convey to them in our parenting: that with great privilege comes great responsibility, and we must use our privilege to question the power structures. As they walked out the door, I was, in my mind’s eye, jumping up and down in the bleachers, ecstatically cheering for them on the court of this gender game. Just like I scream, “THAT’S MY BOY!” when they shoot the ball into the hoop, I was screaming “THAT’S MY BOY!” watching them head off to school. Good for them – they will probably start a trend. I’m wondering if this will cause the school to make some new “rules”? I’m sure all your readers will be holding their breath (as I am), waiting to hear what happened. What a wonderful post, among so many wonderful posts! Thanks for writing this, it gave me a lot to think about it. Way to go Kyle and Owen!!! Kyle looks so handsome with his ponytails-I can imagine him rocking the look in high school and college too!! And I’m sure Owen’s fingernails look gorgeously sparkly (perhaps they’ll set a trend!!!). Btw, do the boys have to tie their locs back while playing sports? I get what you mean about having mixed feelings. It is despairing to say the least that developed nations’ society (what I am trying to say is that I cannot comment for societies that I have not interacted within) allow females to “gender bend” without the same levels of ridicule and bullying etc. that males who “gender bend” will inevitably endure. It is just not fair! I wish your boys all the best as they navigate the world of how they perceive themselves (and project themselves) and how they are received. For one thing they’re lucky to have each other’s support and to have you and Braydon as parents to be there to support them through their journey. My private international school had strict dress codes from Pre-K to Gr 12 (at one point, they even issued school uniform underwear!!) – boys had to have hair cut above the collar, girls could wear 1 pair of stud earrings, boys could not wear earrings, no nail polish. And there were free dress days. I love their unbridled spirit! Very nice post. It’s given me more to think about then I’m able to communicate tonight, but I appreciate you sharing. I also LOVE Miss M’s expression in the second photo. Love this post. Thank you for sharing. As always, your boys have lessons to teach about the intersectionality of privilege, race and gender. Had a couple of tears at work reading the last part of your post. They are very lucky boys, in so many different ways. We have an adopted, other race, super athlete too. I have NEVER liked sports but watching him out there is one of the greatest joys of my life. My husband and I like to say that we never could have made such an athlete so we are just enjoying it all – all-star baseball, travel lacrosse, coaches begging us to let him play tackle football (not happening!). And he’s only 8! It helps to balance the “having trouble sitting still in school” troubles. Yup, they your boys alright. Love it. Love it! My son was a princess a couple of years ago for halloween. 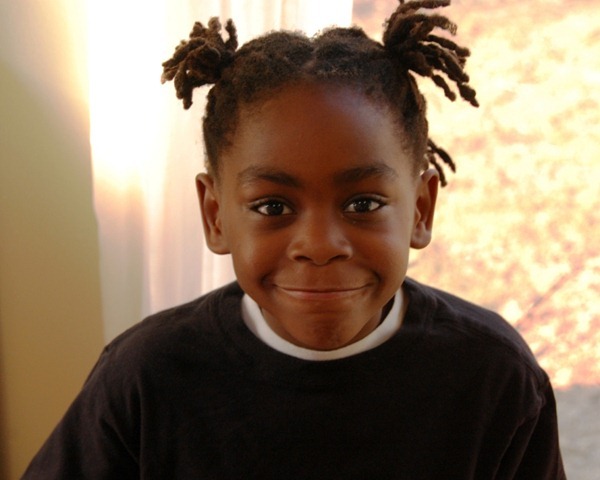 Kyle might like to see a picture of him… similar Haitian ponytails! And by the way… that same “princess” took 2nd place at his State sectional wrestling tourney a couple weeks ago. Athleticism and confidence in who they are… good Haitian boys we have! Sometimes I find that the best way to deal with something like this is to just let it be, and not make such a big deal over it. Your boys appear to be confident and secure young men, and I think they can handle a situation like that. I think some parents tend to unnecessarily over analyze everything. Just relax, Your boys have good instincts. They will be fine. i have to say, parenting a 10 y/o young Black boy who is slowly but surely becoming a young man, it is SCARY AS HELL to send him out into the world not conforming to gender expectations. 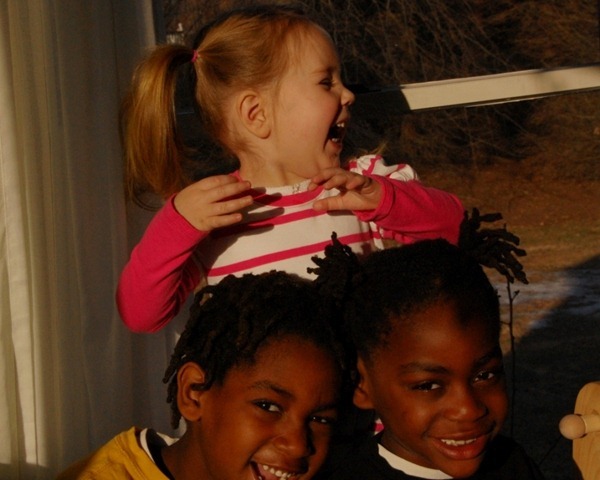 as a transracial foster family, we are subject to so much more scrutiny. as a Black boy, he is subject to so many more expectations of what it means to be masculine (from white and Black people alike). he asks to wear girly things to school, and i am sad to say i actively try to discourage it every time. he just has no concept whatsoever of the social ramifications. he doesn’t understand social cues sometimes so i’m not sure he’d even realize that people are laughing at him or judging him. it is hard to want to protect your child but also let them be themselves. btw, as a queer parent and a masculine woman myself i feel doubly hypocritical about my steering him away from any kind of gender variance! i have to say that in my experience boys with dreads having their hair in ponytails or wearing a headband is not unusual (at least in some places i’ve lived). there have also been trends where a lot of young black men wore braids (of the type we usually think of being for girls) or had two ponytails. i don’t see it as much recently but a few years ago when i was on the west coast it was pretty common. so i think the ponytails thing may be read differently on your kids than it would on a white boy child, possibly in a favorable way. nail polish is a whole ‘nother story obviously! i’d be interested to hear if you’ve gotten any judgment from Black parents about allowing your little boys to transgress gender norms like this.